Opened August 1940 - Closed for re building December 1940 - Closed September 1945. 420Sqn RCAF Halifax X & Lancaster X , 425Sqn RCAF Halifax III & Lancaster X. 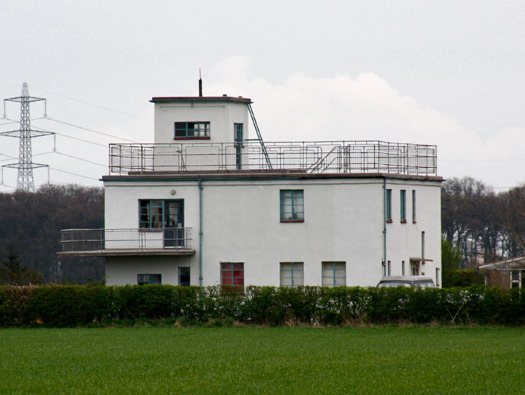 2 x Control Tower/watch offices. 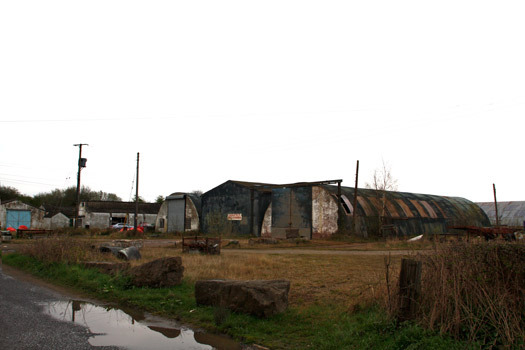 1 x T2 hangar site of. 1 x Blister hangar free turret trainer. 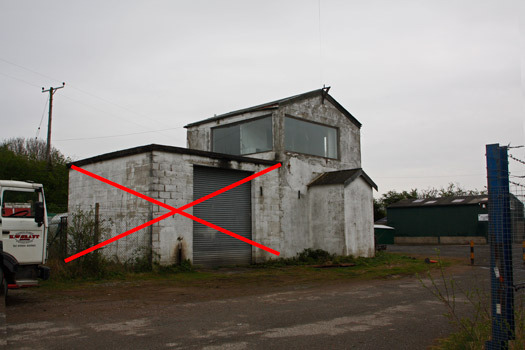 Elevation of a T2 standard Bomber Commands main hangar..
Elevation of a B1 Ministry of Aircraft Production (MAP) hangar used as repair shed for damaged bombers and MAP used civilian workers to take the pressure off of the RAF. 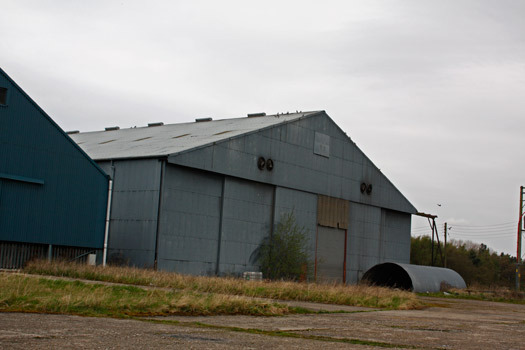 The hangar was always away from the RAF hangars and buildings so that they didn't have to see badly damaged aircraft. 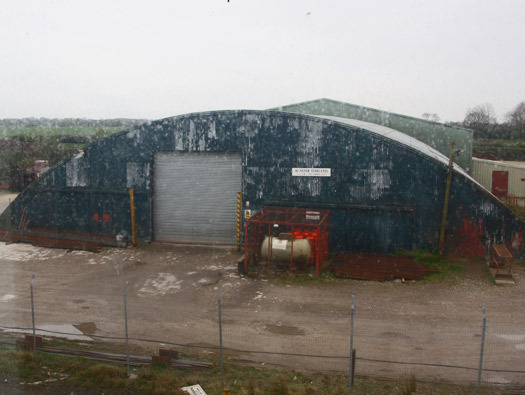 Blister hangar used here as a free training space where different equipment could be laid out for air crew training. 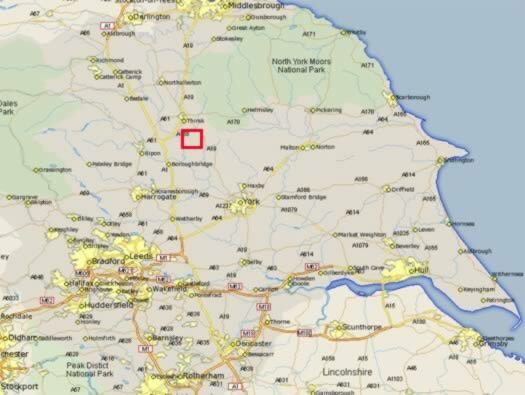 RAF Tholthorpe to the east of the A1(M), exit junction 46 Boroughbridge and work your way east, you may cross a Toll bridge which charges £0.40p, worth every penny. 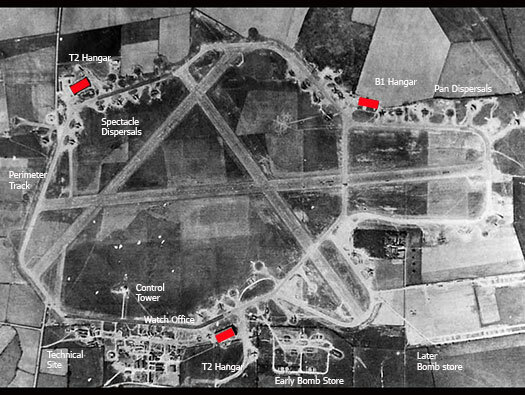 Laid out as a 1942 'A' type bomber station with three runways, two T2 hangars, one B1 hangar, a technical site, several dispersed accommodation sites and a 'D' type bomb store.. Crew lorry collecting from operations. Erks the men that kept the airforce in the air. I came in from the south. 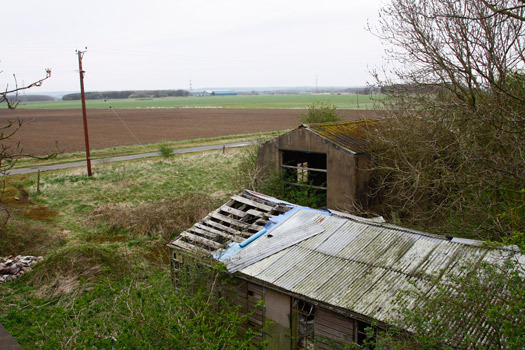 First a chicken farm that may have huts still there?, past the WAAF site, a squash court converted to a house (no photo), a communal site, tech and then on to the airfield. I think this is the squash court. 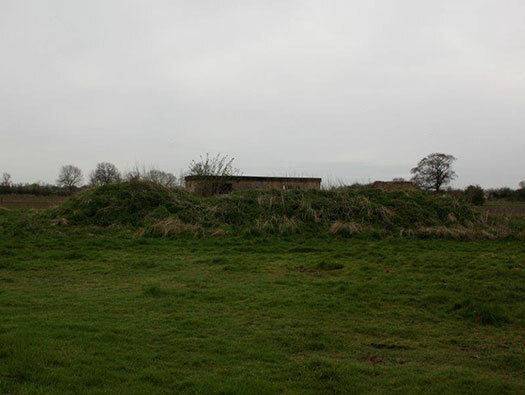 The WAAF site or Waffery. No.77Sqn RAF was formed at RAF Finningly November 1937 with Hawker Audax. 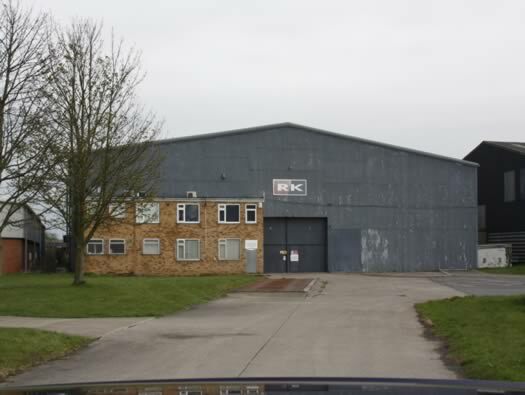 No.434Sqn RCAF were formed here June 1943 with Halifax MkVs. No.431Sqn RCAF were formed at RAF Burn November 1942 with Wellington B.X. 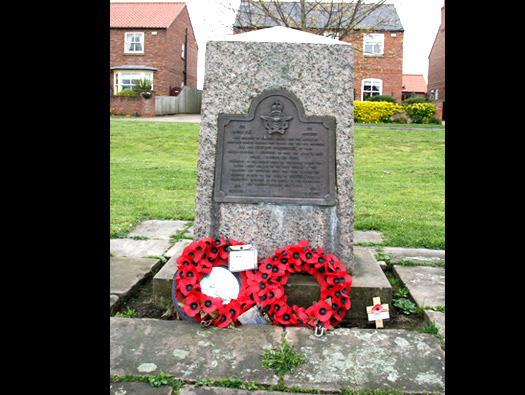 No.420Sqn RCAF were formed at RAF Waddington December 1941 with Manchester's. No.425Sqn RCAF (French Canadian) were formed at RAF Dishforth June 1942 with Wellington's. There were WAAF's in WW1 but in WW2 they were brought into the RAF in greater numbers to run the camps, drive, mechanics (air & vehicle), radar, ops room, etc, etc. 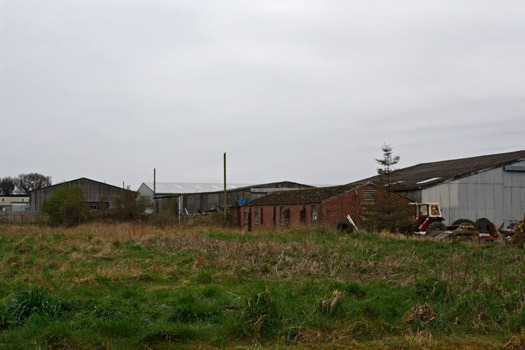 The derelict site on the right may have been another communal site. 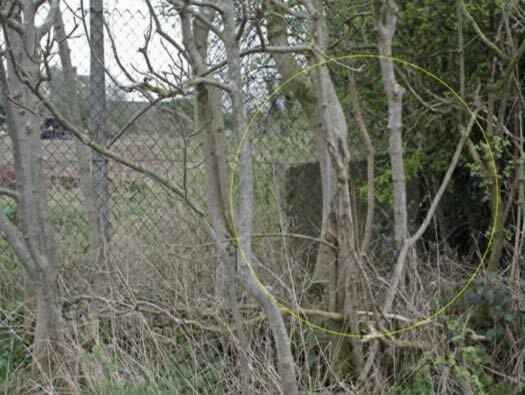 The building is not WW2 but both sides of the gate posts are these concrete blocks like anti-tank blocks. 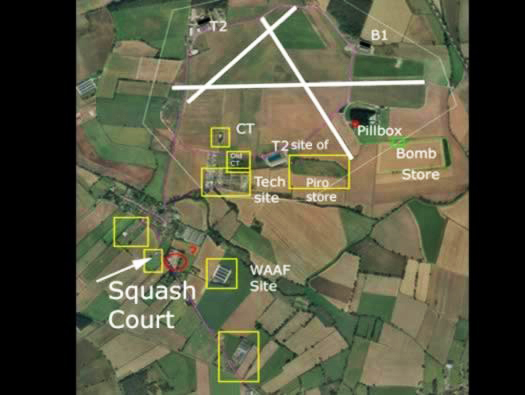 The yellow arrows are the blocks and the white arrow was the squash court and now converted into a house. I did not take a picture of it Yellow squares more dispersed sites. 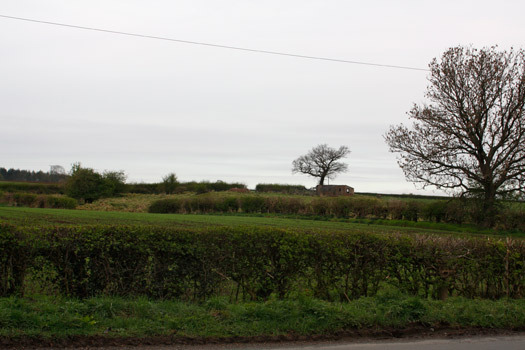 Another site on the hill. 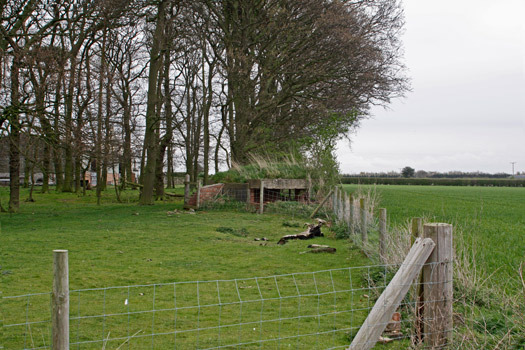 There is a hut and a Stanton air-raid shelter left. 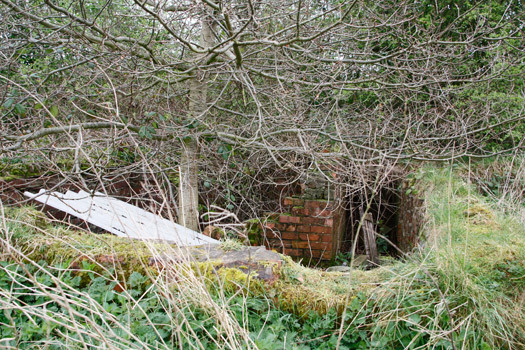 This may be a wartime hut ? 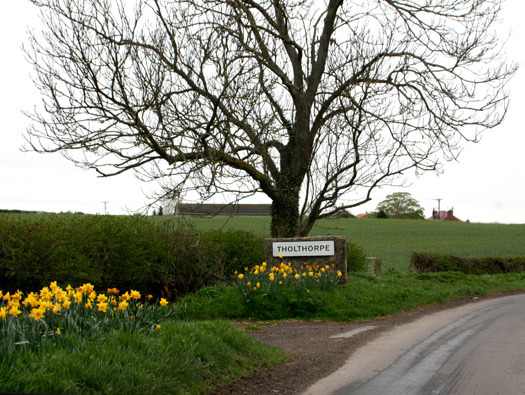 The white circle is the scout hut, yellow the next hut & blue a hut base. 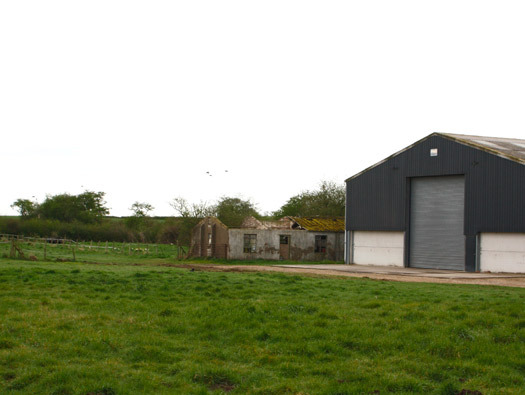 Behind the new barn is a communal hut. 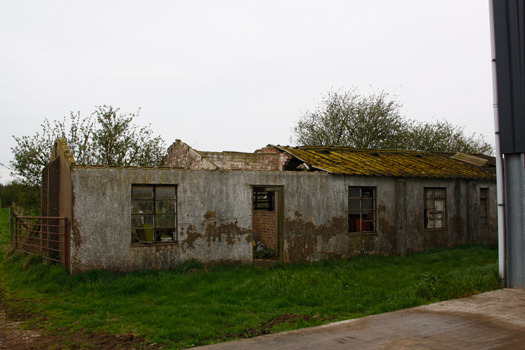 RAF Tholthorpe started life around 1930 as a grass field for the use of RAF Linton-on-Oise. 1940 it was used by No's 51 & 58 Sqn's Whitley's. Water pipe and roof falling in. Original wiring, live and earth. 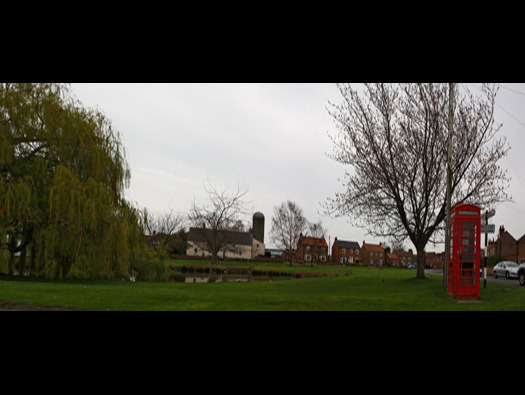 Tholthorpe Village green & The New Inn. All in temporary accommodation. 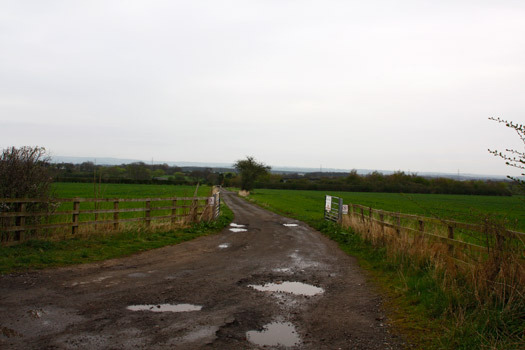 This was a wartime only airfield. The food, it made a very welcome break in the day. 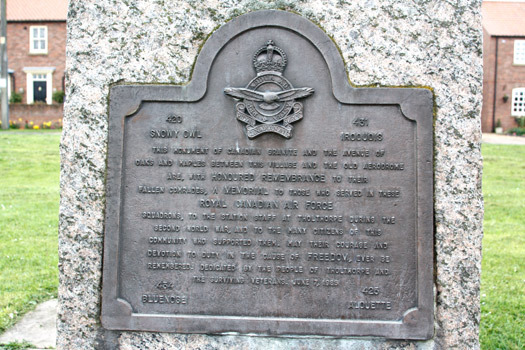 Memorial on the green to 420, 431, 434 & 425 Sqn's Royal Canadian Air Force. 420Sqn RCAF arrived here December 12, 1943 after converting to Halifax III's and stayed until the end of the war. Plan of the technical site. Showing the layout today, the MT is the only part I am not too sure of? Technical site Main Store 5852/42. 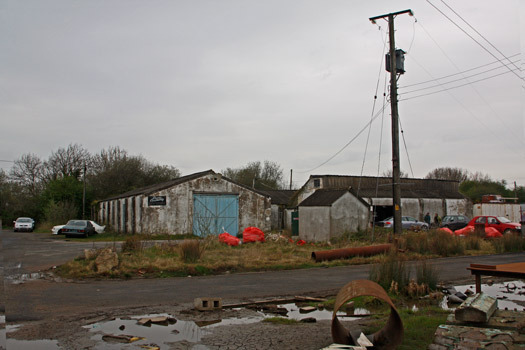 Two Romney huts. 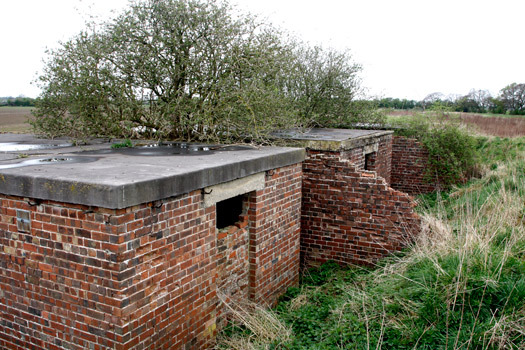 These huts were very useful and could be used as stores, engineering or even a NAAFI. Plan of the technical site today. 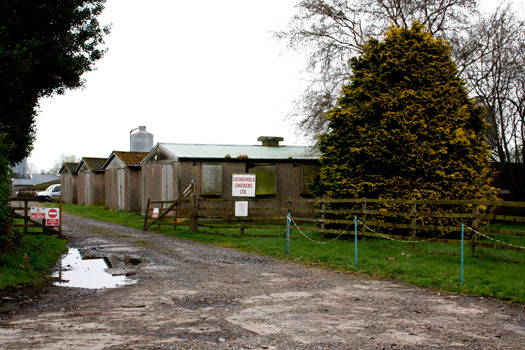 Romney Huts. Main Store 5852/42. 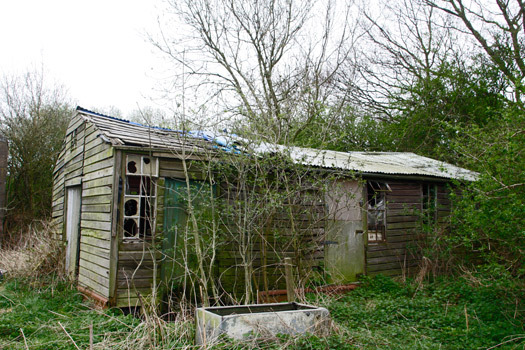 The centre hut is post war and I think nothing to do with the airfield. Main store held every item needed and possibly several that were not needed. Blister hangar Free Gunnery Trainer 7316/42. 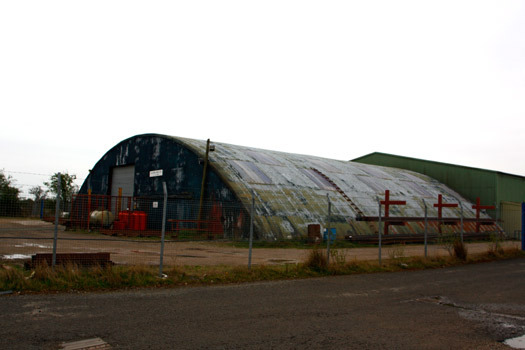 Blister hangar used not for aircraft but as a free gunnery trainer. 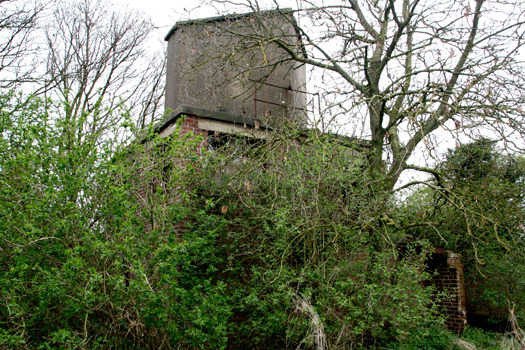 This is where gunnery training would have taken place with mock up turrets. They became very sophisticated in a pre computer age. Inside a Free Trainer at an American airfield showing how this one may have looked. Blister hangars were designed early in the war as a quick and cheap way of covering small aircraft, later as the war progressed they could use them as trainers as in this case. There is a good line drawing of a turret trainer in Paul Francis book 'British Military Airfield Architecture' page 151. It shows a concave screen which an image was directed on and a form of scaffolding tower with several levels, one with a dummy turret and another for a controller, there was also a power unit. Bomb aimer's and pilots could hone their skills by training on this apparatus. 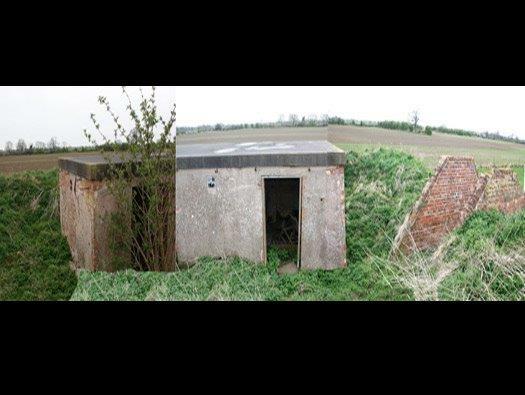 The pilot would fly a over a map projected onto the hut floor and the bomb aimer would take over as they neared their target. 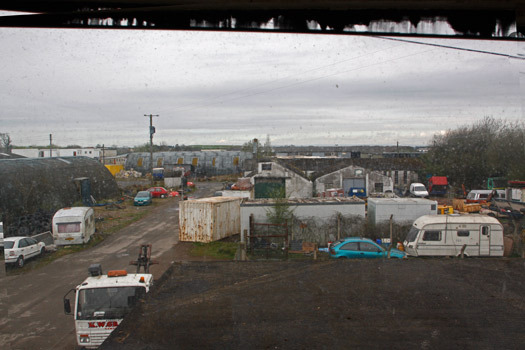 The view from the AML Teacher window. 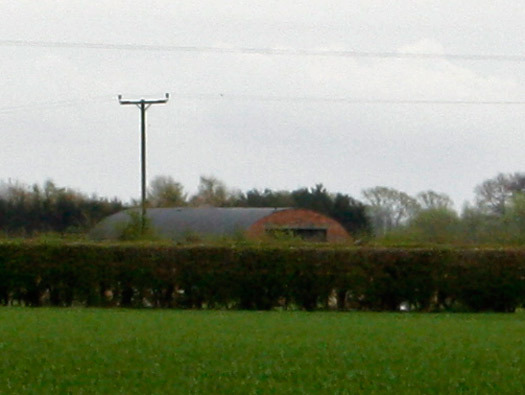 Parachute store, temporary brick huts and a Romney huts in view. This is where all parachutes would pass through for checking, drying, packing and storing. 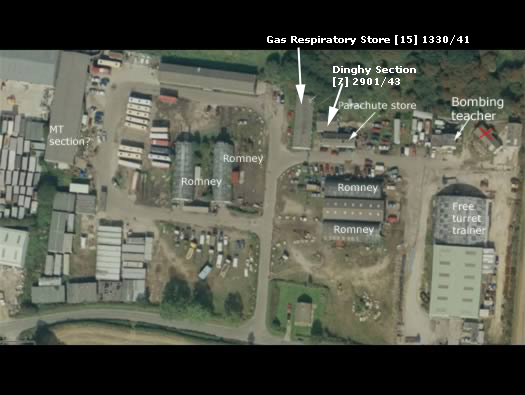 Gas Respirator Store & Workshop 13730/41 next to the parachute store. Gas was still a worry to the Allies. Later when the threat receded the stores were used for medical stores. This could be the site of the MT section. Plans of a 14bay 9026/40 of a large MT section that was possibly here. 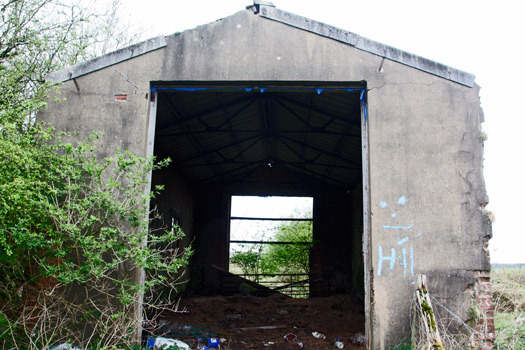 Half of a 14bay Mt garage at RAF Clyffe Pypard. 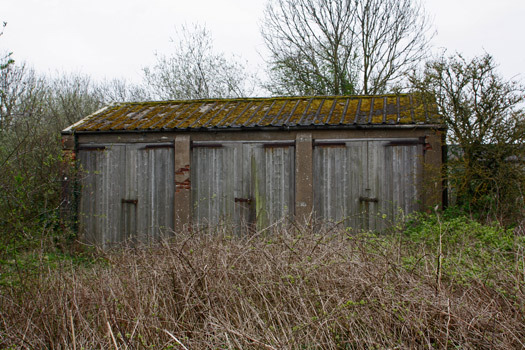 One large shed and the other a Romney hut. WAAF's working in a an RAF workshops. 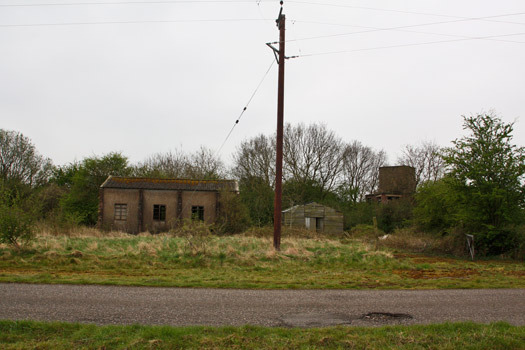 An 'A' class airfield as this one became, had a perimeter track 50ft wide connecting all the runways of 150ft with 36 aircraft dispersals. In the early 40's Tholthorpe was a grass field which in wet weather gets very boggy and modern bombers starting to get heavier and bigger. A new airfield was needed. 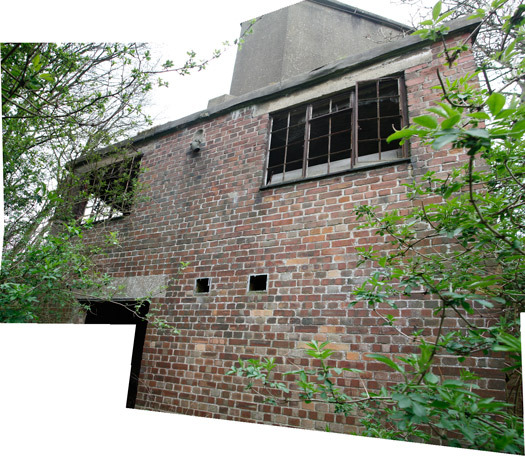 So a complete re-vamp to turn Tholthorpe into an 'A' class bomber station took place from January 1941 to June 1943. 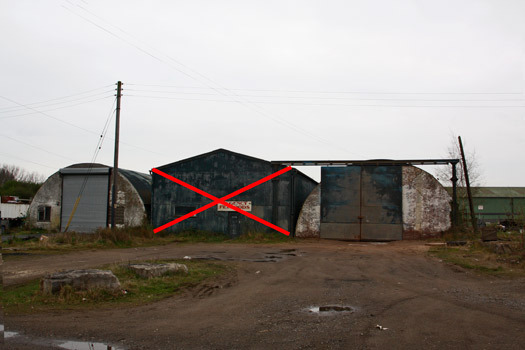 Three hangars (2xT2 & 1 B1), a new watch office, a full bomb store & a full dispersed accommodation. 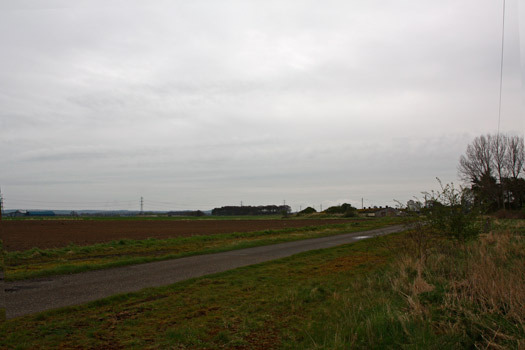 The circular perimeter track was the original airfield and later the runways were added and the main one was extended. Early 'A' class had around 36 circular dispersals, these were very effective in keeping the aircraft dispersed around the perimeter and also a good firm base for the plane to sit. But God forbid you drop a wheel off the concrete onto the mud or grass and it was a heck of a job to get it back on firm ground. The second type of dispersal that came into use after 1942 was the Scissor or Spectacle type. The circular pans damaged aircraft doing a tight 360deg turn, whereas with the spectacle they could drive in and continue out without turning. 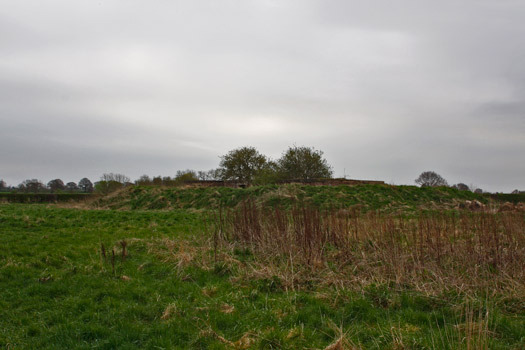 Tholthorpe had at least four (possibly more) spectacle and the rest circular. Halifax on its dispersal. 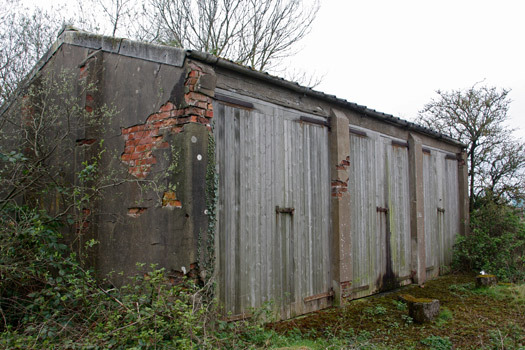 There would be a ground crew hut and latrines with several dispersals per hut where the ground crews of those aircraft, could rest keep warm and store things and also use the toilet. 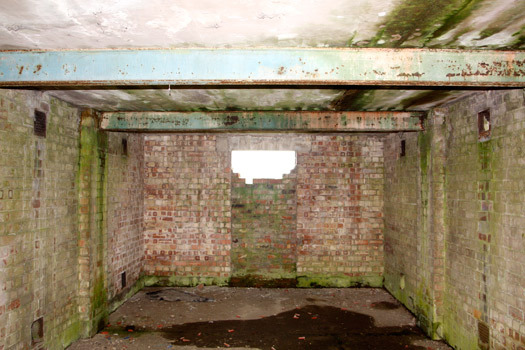 With the technical site in the S/E side and S the old bomb store, S/W the later bomb store. N/W a B1 repair hangar. N/E another T2 hangar and later Spectical dispersals. 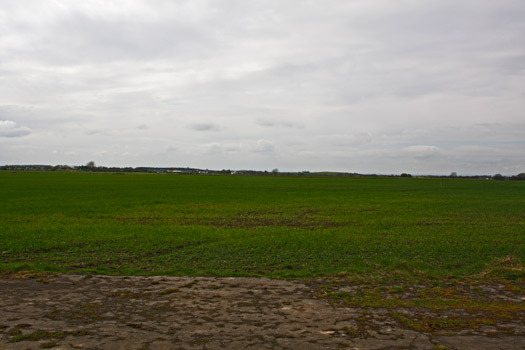 When opened it was an early grass airfield, a small perimeter track able to take vehicles around the landing ground. After the winter of 1940 when no flying could take place due to water logging, three 150ft wide runways were laid and the perimeter track increased to 50ft width. 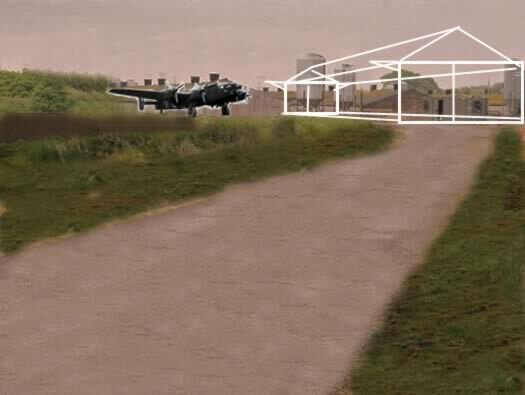 Then the main runway was extended as heavy bombers needed more length and the large bomb store added and it became a full 'A' Class bomber station. Whitley bomber on an old grass runway. Stage two was to upgrade the perimeter and add three runways. Halifax using a tarmac & concrete runway. And stage three to increase it to 'A' Class standards. Halifax low level, probably a Canadian just finished his last sortie. 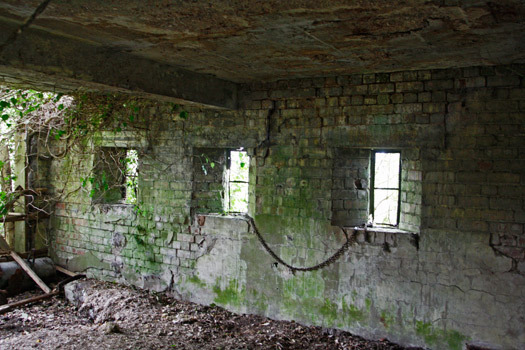 This Watch Office for All Commands 343/43 would have been added in 1943. Airfield plan with the control tower marked. Lubricants & Inflammables Store 12406/41. 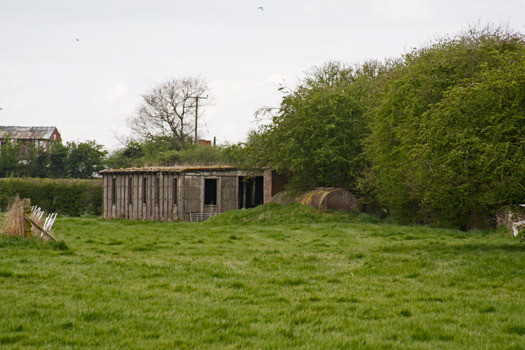 Temporary Brick hut behind the old watch office and just inside the airfield site. 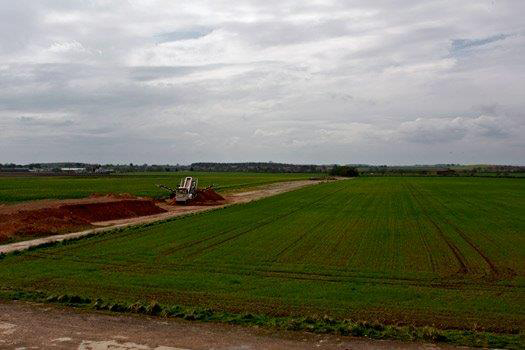 Three concrete and tarmac runways were constructed and a perimeter track 50ft wide. 36 heavy bomber hard stands. 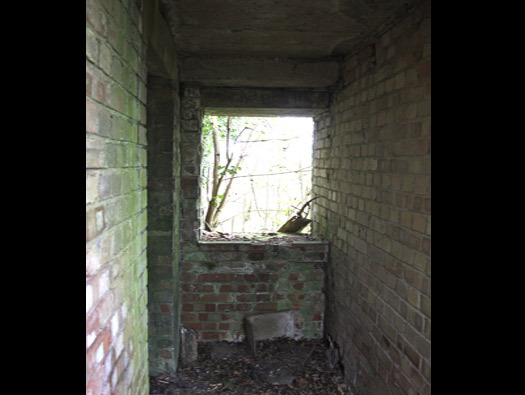 Accommodation for 1700 people of which there were 200 WAAF's. Night Flying Equipment Store 12411/41. Night flying equipment stores held all the goose neck flairs, beacons and any other equipment used for night landings and take offâ€™s. An airfield may not have had lighting or if they did and the electricity failed the oil lamps could be put out. 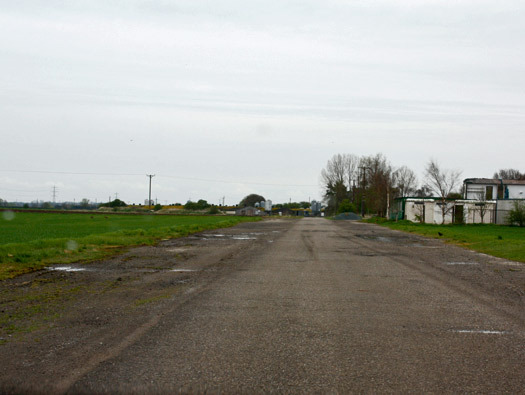 Fine on a small airfield but as here a very long runway of over a mile to put out all the lamps. Goose neck flairs, paraffin filled heavy (like watering cans) with a wick in the spout, then lit by a match it would burn for quite q long time. Goose neck flair at work. Chance light a sort of searchlight that could be deployed at the end of a runway and the light pointed down its length. Just another aid to help a pilot land in the dark. Note the concrete door stops to hold them open and also to stop some Erk on a tractor bumping in to the door. They thought of everything. Watch Office for Bomber Satellite Stations 13079/41. 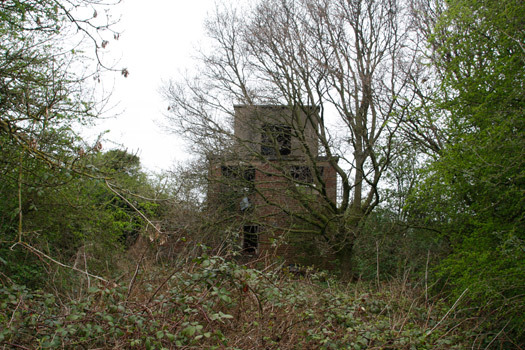 Hidden in the trees is the original Watch Office 13079/41 it would have had two annexes, one for the meteorological office and the other for operations. The trees have been removed now but what is going to happen I have no idea. Plan of what I could see. A protected operations room you can see that by the window showing up the thicker walls. 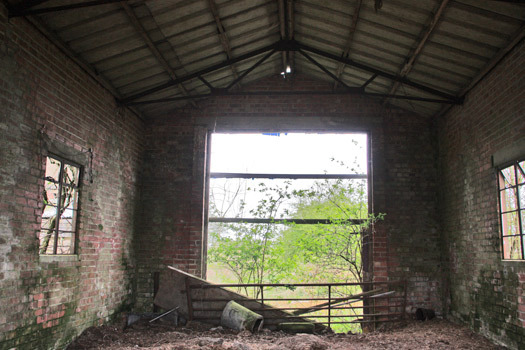 This is where pilots and crews of the Witleys would have collected before take off on the next raid. Inside an ops block on an American base. PBX room. 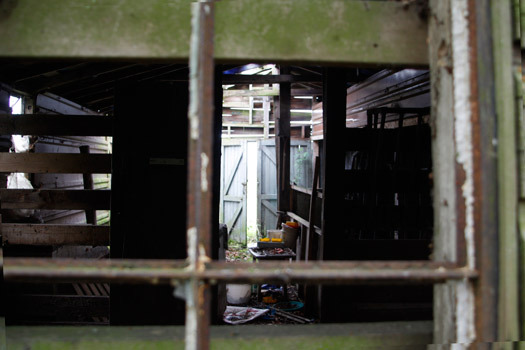 (Private Branch Exchange) the internal telephone system in the camp. Looking around the control room. The left two windows face west, right hand two south. Its odd that there are two windows in the three walls facing away from the airfield and one window & a door overlooking the airfield ? I carefully climbed to the top. Note the bracket on the lower wall R/H side, more later about them. Plan of the roof top. 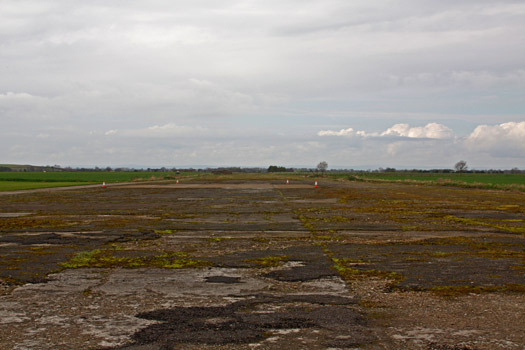 The triangular structure was a "Large 'runway in use' marker boards" to show which runway was in use. 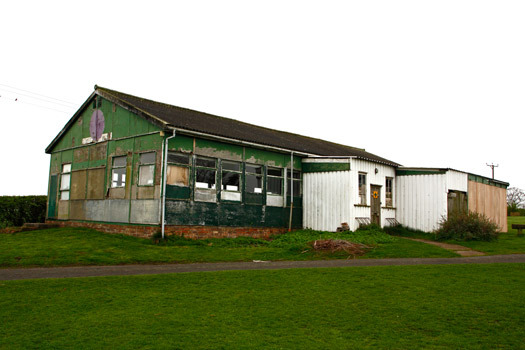 The triangular building on the roof for the large runway in use markers. The British numbered runways 1,2, etc., when the Americans arrived the system was changed to number them by there heading in degrees. Triangular tower for the boards. The lugs to hold the boards on. Grafton Underwood with its boards up. View NW over the airfield. 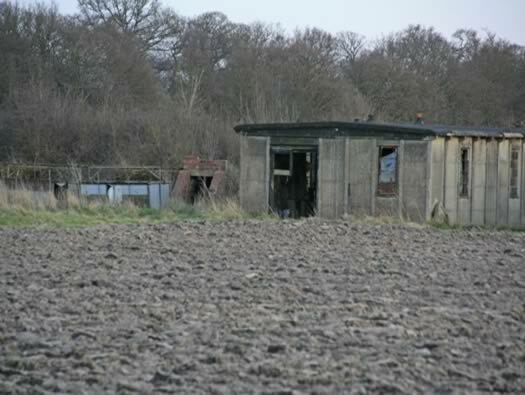 A wooden huts & the Floodlight Trailer and Tractor Shed 1296/40. Re-opened and four Canadian squadrons with Halifax heavy bombers arrive. No.420sqn RCAF 'Snowy Owl'. No. 425sqn RCAF 'Alouette'. No.431sqn RCAF 'Iroquois'. No. 434sqn RCAF 'Bluenose'. 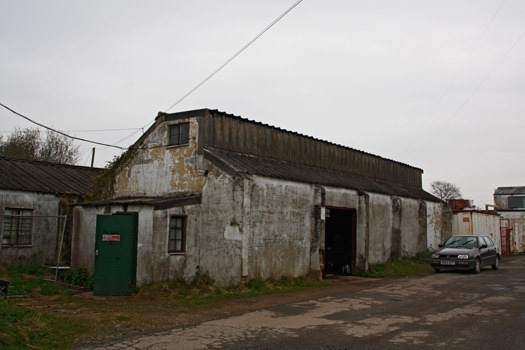 Link to another Tholthorpe Aerodrome. 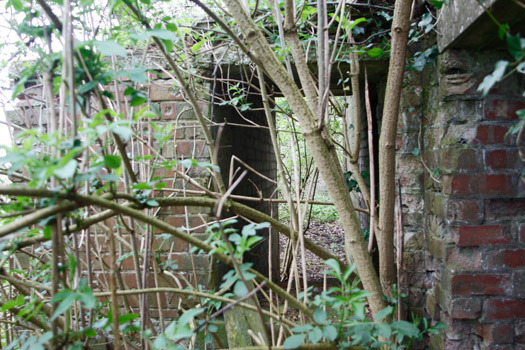 Allerton Park, Knaresbough was HQ of No.6 Group RCAF. 6 Group aircraft flew 40800 operational sorties. 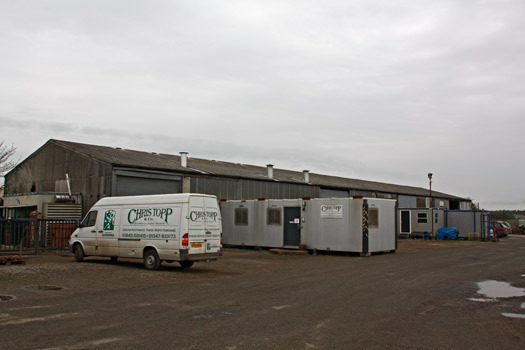 Flood Light Trailer & Tractor Shed. 12411/41. This was a drive through shed so there was no need to disconnect a trailer. Armoury & Armoury Maintenance 9882/42. Built in Temporary Brick (half brick) which was a cheaper and quicker construction than the pre war designs. The windows were standard Crittal steel windows and can still be bought today. 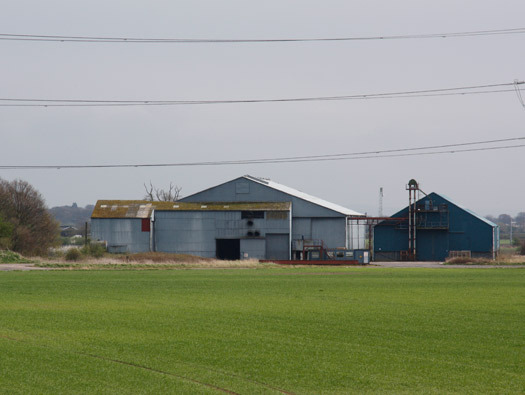 The method of building with piers along the sides where trusses lay on for strength goes back to WW1 designs of military hutting and can be seen at RAF Duxford around the hangars. A group of dedicated men would clean the guns after a raid and make sure that they were ready for the next one. 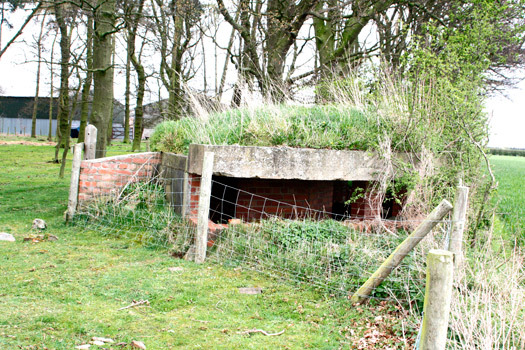 Blast shelter a very quick and easy build and also easy to dive into if necessary. A better view of how it would look without all the undergrowth. 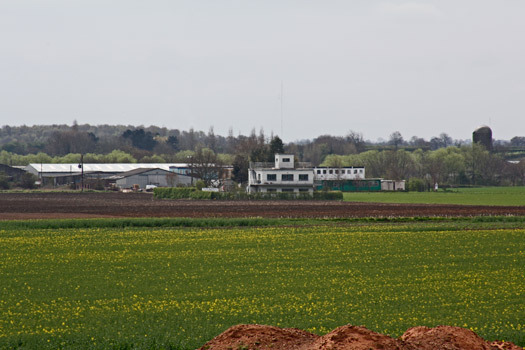 The original (pre 1942) main airfield site with all the buildings grouped around the watch office. De briefing and a hot cup of tea. Crew arriving at their plane. One of the ways crews were delivered to their planes. The name Watch Office changed in the mid 40's to control tower. This was due to two reasons, one - only a watch was kept on an airfield and their pilots could land and take off at almost their own discretion. Two - by 1942 onwards many more aircraft were being used at one time and a form of control was needed to make for a safe and smoother running of the airfield. So the Control Tower was named & designed and placed in a position where it could see ALL the airfield. RAF Acaster Malbis showing how the control tower could see the airfield. 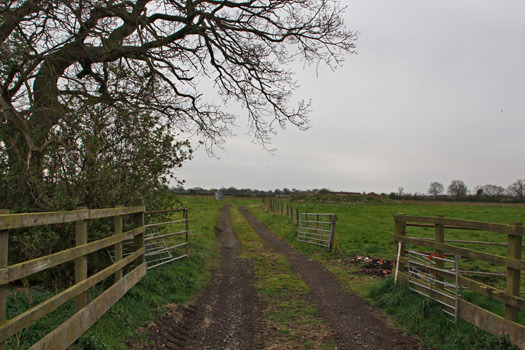 Perimeter track leading to the site of the first T2 hangar. 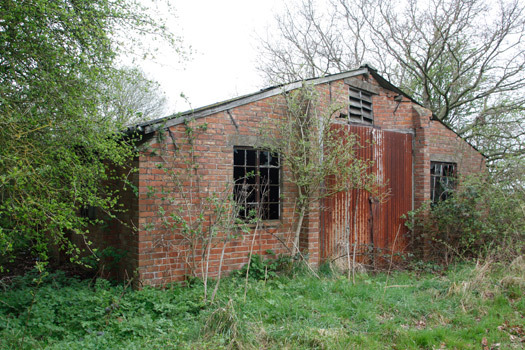 Any pre & wartime hangar can be called a shed. So that is why on some sites Shed is used. View from above with the T2 superimposed on the area. 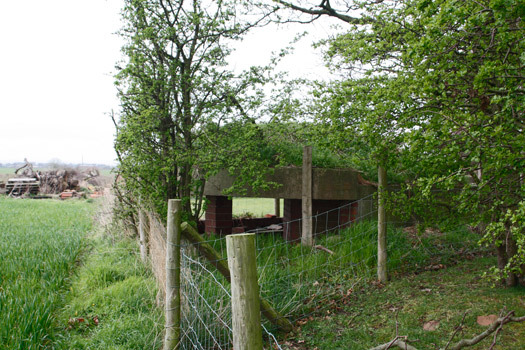 BCF Hut & Stanton Air-Raid Shelter. 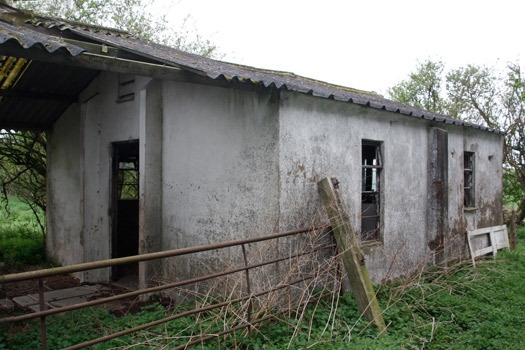 A hut consisting of a frame of reinforced concrete posts into which panels could be slotted. 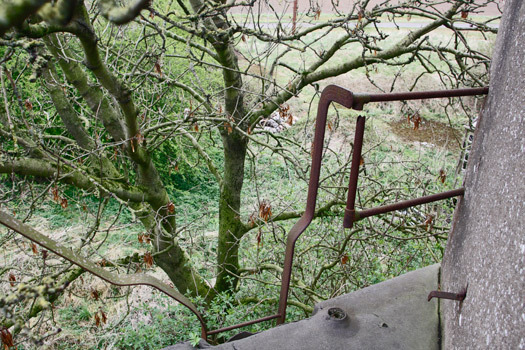 Designed by the British Concrete Federation (BCF) during WWII. 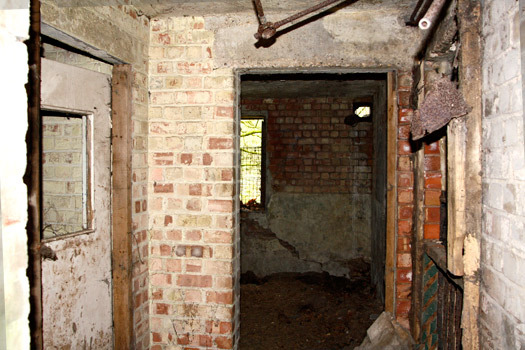 Inside a BCF hut at RAF Snailwell. There may have been more items here. One of the protected entrances. 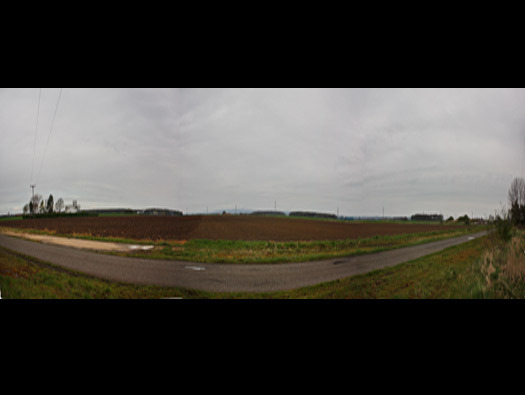 I have had to cobble together three photos to make this up. The component store with the entrance showing up on the left. 3 compartment Incendiary and Pyro store 13436/40. 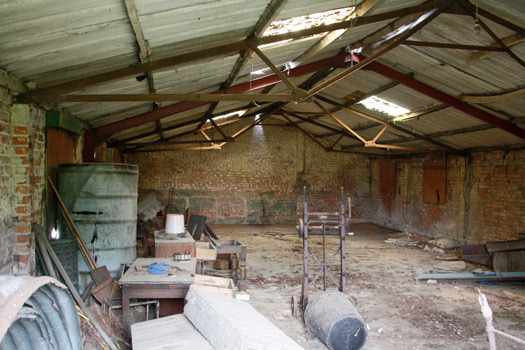 Incendiary and pyrotechnic store for flairs, markers & incendiary bombs. This shows the earth wall around the outside and brick walls between each store to keep them separate in case of fire..
3 compartment Incendiary and Pyro store 13436/40 inside. Check out the size of the I beams in the roof. Why so strong. 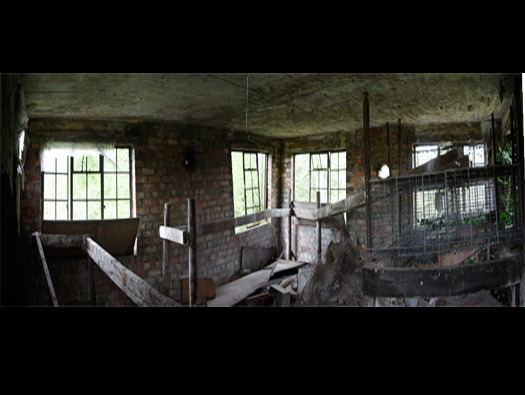 In a large 24ft Nissen hut. UH Fuzzing Point inside view. Bomb trains waiting to leave the bomb store area after fuzzing to go out to the aircraft. 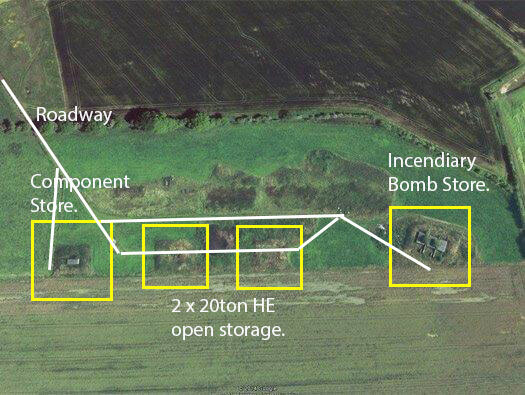 Air photo of the 'D' type full heavy bomber bomb store. 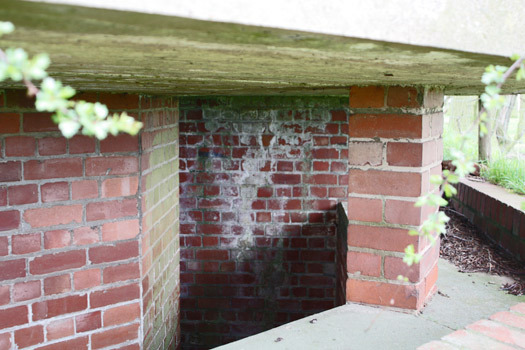 Seagull trenches were an early open pillbox defence to protect the bomb storage area I think. 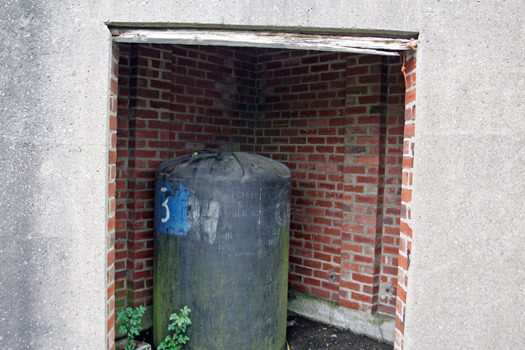 Made of standard red brick and reinforced concrete roof. It just may have covered the small bomb store area ? A brick tile used to cover electrical cables. There are several in the woodland. East west main runway about 6,000 feet or 1.15 miles (1,848meters). B1 MAP Hangar (Ministry of Aircraft Supply). 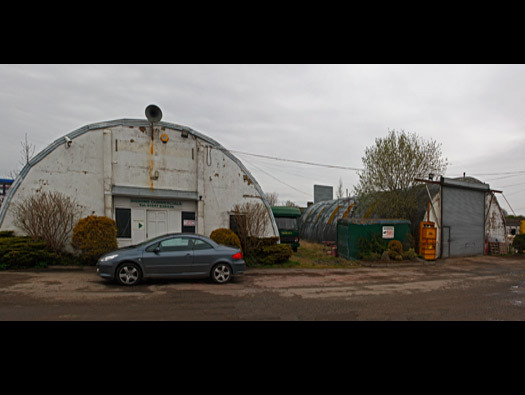 The B1 MAP hangar was built to help over worked RAF ground crews to repair severely damaged aircraft. It was manned by civilian workers and did all the heavy repairs, i.e. flak damage. Hand made clay water pipes lying around. 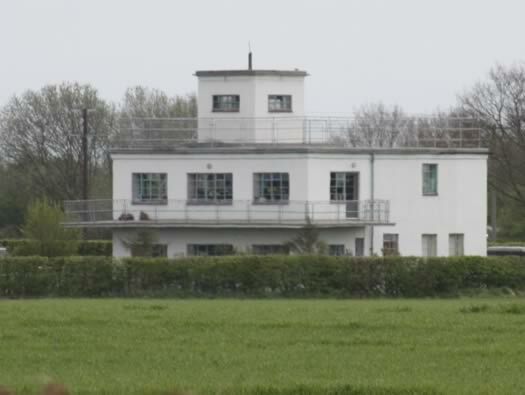 Nice to see the control tower in use again even if it is a house. Bomber aircraft are quite heavy, but a wind can quickly enable them to fly when just stood on an open airfield. 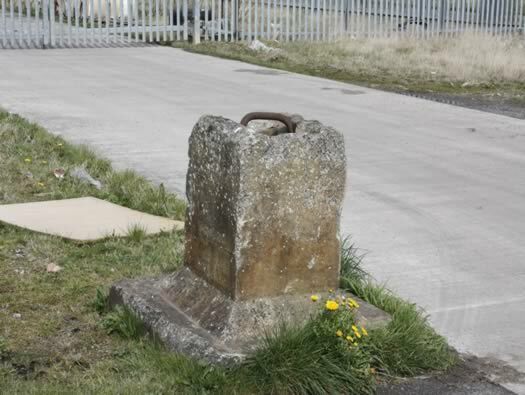 So great lumps of concrete were set into the dispersals with a large steel bar inserted. A cable/strop would be attached to the aircraft and held down. Circular aircraft dispersal (frying pan or just pan) had several of these set into their concrete base and planes could be tied firmly down in high winds. A light aircraft tie downs.. The RED runway on the plan. Made by the Tees-side Bridge and Engineering Co.
Elevation of a T2 hangar. 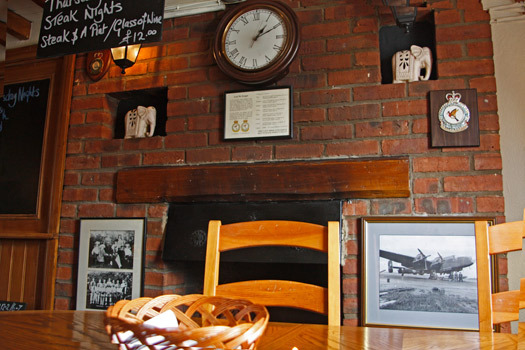 Back to the New Inn showing the details of aerodrome up on the hill.